Can I make a confession? I never ate at a Chipotle until a few months ago. They didn’t have them in the small North Carolina town we lived at this time last year, and while I had heard about them, I had never actually visited one. When we moved to the DC area last May and finally visited one I was honestly a little bit overwhelmed-it struck me a little like Starbucks where everyone else was super familiar with the menu and “system” they have for ordering and I had no clue what was going on! Combine the first 5 ingredients and mix well. Put steak in a gallon plastic bag and pour seasoning mixture over it. Close and shake bag to coat steak. Marinate steak at least one hour. Preheat grill to medium high heat. Add steak and cook for about 3-4 minutes per side, until cooked medium. Chop steak into 1/2 inch cubes. We serve our burrito bowls buffet style with all items set up in a row on the counter so we can walk along adding what we each like to customize it! 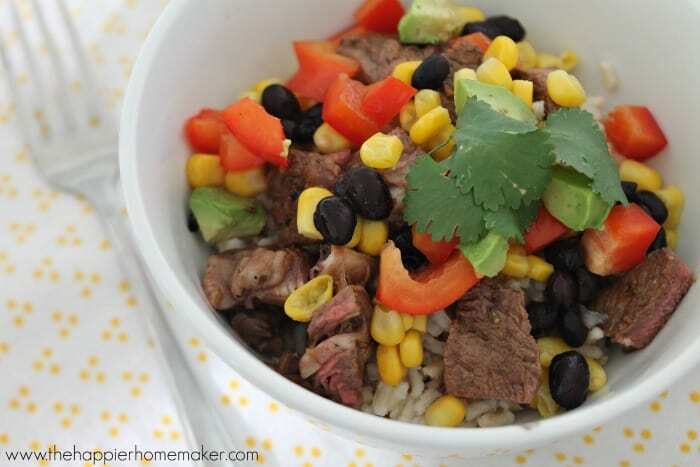 I eat mine with brown rice, steak, corn, peppers, beans, pico de gallo, avocado and cilantro but my husband and sons will sometimes add cheese and sour cream as well. 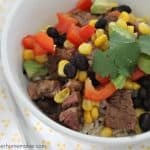 I love that these burrito bowls are filling and full of amazingly fresh ingredients-and the steak is perfection marinated in such rich seasonings! 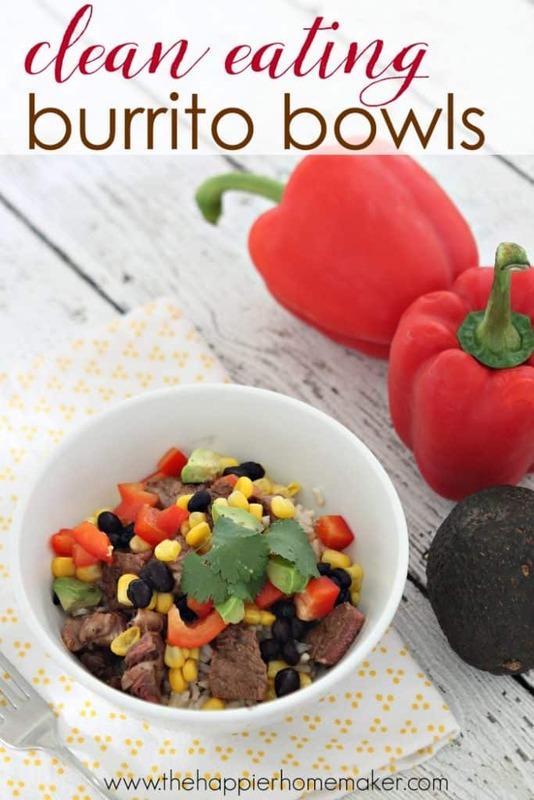 Would you add something else to the burrito bowls? 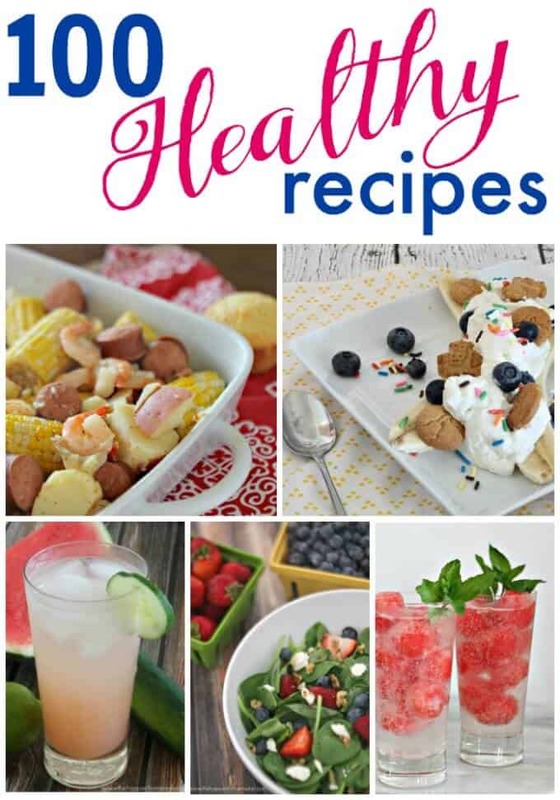 What favorite topping of yours did I miss in my recipe? Combine the first 5 ingredients and mix well. Put steak in a gallon plastic bag and pour seasoning mixture over it. Close and shake bag to coat steak. Marinate steak at least one hour. Preheat grill to medium high heat. Add steak and cook for about 3-4 minutes per side, until cooked medium. Chop steak into 1/2 inch cubes. Serve buffet style. This sounds really good. I have never been to Chopotle. We do have one in town, but the packed parking lot always turns me off. I don’t do well with crowds especially if I am hungry. Honestly, I’ve never been there either. However, this looks like a simply tasty, yet quick dinner. No wonder that place is so popular!